The giveaways keep coming! This time it’s from our lovely friends over at Chictopia. I’m sure you all know what Chictopia is. It’s actually the first ever online fashion community I joined. (View my profile here.) Apart from allowing it’s members to post outfit shots, Chictopia also has an online shop where members can purchase items from various sellers called Shop Chictopia. 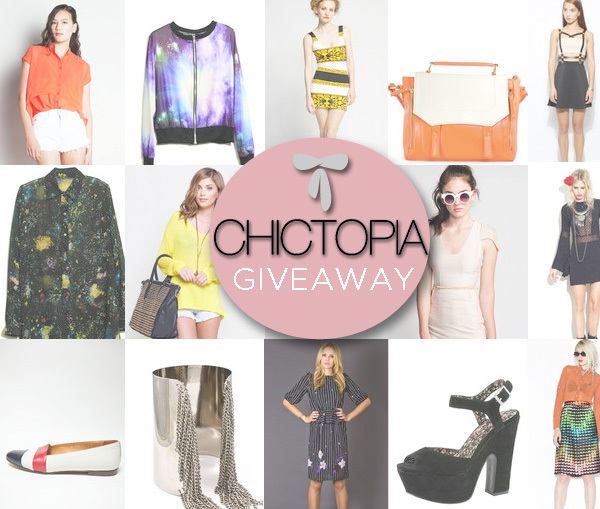 For this giveaway, ONE lucky winner gets to pick out any item from Shop Chictopia as his/her prize. Exciting, right? Like Chictopia on Facebook and follow them on Twitter. Leave a comment below with your name and Twitter name. No multiple entries please. This giveaway is open to everyone. Deadline for entries is on August 29, 2012, 12:00 noon, local time (GMT +8). Winner will be chosen via Random.org and announced through my Twitter. Good luck everyone! ***Bring home a bunch of photos from NY FASHION WEEK! I know you can make it. Camille, Thank you lots for this amazing chance! I really really appreciate ! 1) I followed you on Twitter (@jalimisi), Bloglovin’ (jalimisi82@gmail.com) and Fashiolista (jalimisilin). 2) I LOVED your photo by clicking on the red heart. 3) I Liked Chictopia on Facebook (Jali Misi) and follow them on Twitter (@jaimisi). My Twitter name is jalimisi@jalimisi. I sign up at Fahiolista & Bloglovin for this giveaway, I didn’t know how fun and inspiring those websites are.. but nothing beats the inspiration here at itscamilleco.com. Thank you and God bless! I signed up at Fashiolista & Bloglovin for this giveaway, I didn’t know how fun and inspiring those websites are… But nothing beats the inspiration here at itscamilleco.com. Thank you and God bless!! I follow you on twitter as @TEBblog and on bloglovin’ and fashiolista as Phoebe Hiltermann! Oquialda, Erra – Joy R.